Many patients (Table 1) face daily problems with urinary retention and incontinence. We will describe a new device to assist those patients with severe urinary dysfunction non responsive to all other current therapy. This would include military personnel or service members with who have experienced traumatic pelvic or spinal cord injury requiring urogenital reconstruction or bypass to protect the upper urinary tract and maintain kidney function. This device will assist in improving quality of life and activities of daily living for these unfortunate patients. In doing so, also provide a significant reduction in long-term costs associated with caring for these patients on a daily basis and in long term care facilities. Over the past 10 years significant investment has been made in stem-cell exploration and tissue engineering for urogenital reconstruction with limited success, this option with its technological advantages (Table 2) will address the needs of this population of patients currently underserved. We will describe our approach in the creation of a novel lower urinary tract augmentation implant (Figs 1-4) with a new mechanical valve system (Fig 3) replacing the urethral outlet and functioning as an artificial urinary sphincter. This device will be surgically implanted preserving the bladder and ureters functioning as a normal collecting system and operable by patient and\or caregiver without touching genitalia. A biologically compatible silicone rubber biomaterial will be used to create a collection base and drainage tube to function as the lower portion of the urinary tract eliminating the need for chronic indwelling catheterization with its inherent risk of chronic infection. To date we have successfully completed over 26,000 compression open and close cycling of our artificial urethral sphincter (Fig 3), which is equivalent to over 18 years of in-vivo use. At this point, no compromise of the silicone rubber material mechanically or visually has been noted. Current therapeutic options available for patients with catastrophic urinary dysfunction have been major surgical procedures resulting in creation of neo-bladders with portions of the intestinal pouch or chronic indwelling catheters. None of the options to date have provided the return to quality of life and improvement of activity of daily living these patients deserve. With so many of our military personnel returning with catastrophic pelvic injuries and spinal cord damage this novel option provides an answer to the question of how do we treat these brave individuals? Our next step will be additional in-vitro bench testing of our materials and device and then pre-clinical trials to gather the safety and efficacy data required to bring this device to market to add another tool to the armamentarium we physicians have to assist patients with severe lower urinary tract dysfunction. 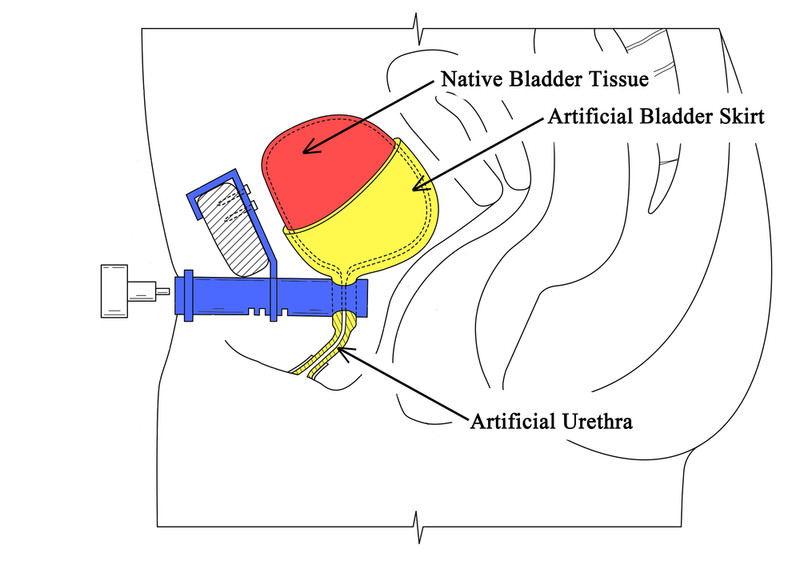 In the future, a hybrid device configuration of our lower urinary tract augmentation biomaterial implant could be the exploration of an alloplastic bladder substitution (Fig 5) using the same novel mechanical valve system for bladder carcinoma patients in lieu of cystectomy and urinary diversion surgery. implantable silicone rubber biomaterial of different durometer hardness. · The artificial urinary sphincter (valve housing) is made of a long-term implantable PEKK biomaterial. "Giving Patients Back Their Lives"
"Where Incontinence Comes to Dry"
"Improve Restorative Treatments and Rehabilitative Care"